The cost of billboards in New York ranges from $3,000 to $20,000/month, and in Los Angeles billboard costs range from $2,000 to $15,000/month. 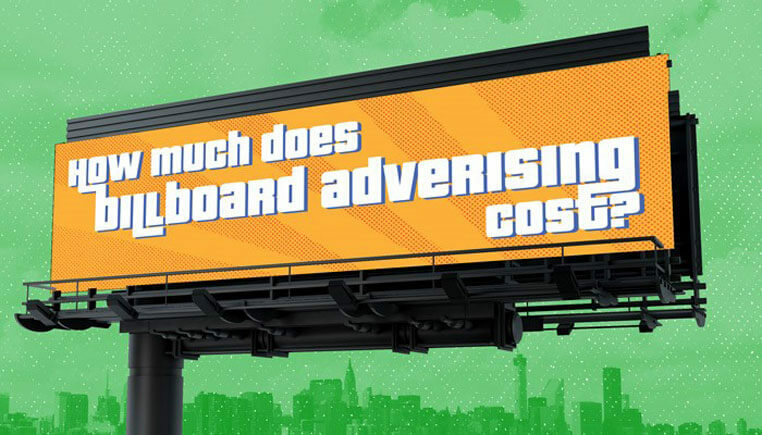 In Chicago, billboards’ cost ranges from $2,000 to $12,000; San Francisco billboards’ cost ranges from $2,000 to $12,000; and in Philadelphia billboards cost from $1,500 to $12,000/month. 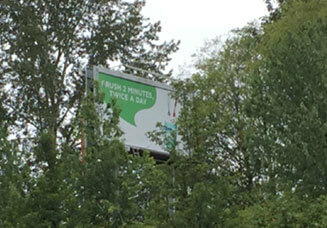 Billboards are almost always quoted on a 4-week as opposed to a 1-month period. This means that if an out of home advertising company quotes you $1,500 for a year contract, they mean 13 4-week periods for $1,500/period. In addition to the monthly rent, a billboard advertising client must pay a production fee for the vinyl. A good rule of thumb is that the production fee will be 50 cents per square foot for the vinyl. 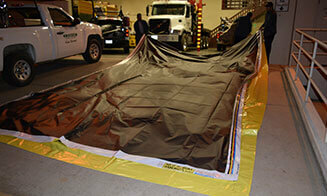 The production fee will be $336 for a 14′ by 48′ billboard, $189 for a 10.5’ by 36′ billboard, and $64 for an 8′ by 16′ poster. Not every out of home advertising company is a Geopath subscriber, but most large out of home advertising companies are. The typical billboard sells for a CPM, or cost per thousand impressions, of $5.21, according to Peter J. Solomon. 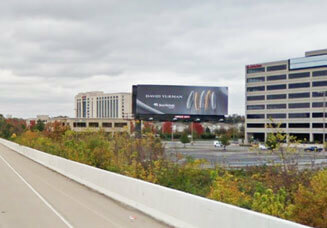 A freeway billboard that gets 400,000 impressions in a 4-week period will be priced at $2,000/period. A billboard on a country road with only 30,000 impressions a month will rent for only $600/period. You can usually get impressions data from your billboard company to verify what sort of CPM you are paying. Billboards in cities cost more to rent than billboards in the country. More traffic and more people mean higher impressions. The are of a city can also affect the pricing as well. 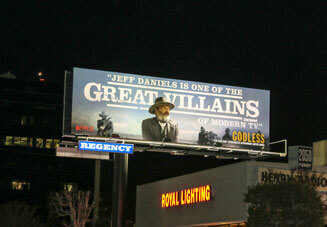 For instance, a billboard on Sunset Blvd. will range from $15,000 to $35,000, and billboard at the heart of the Sunset Strip will range from $25,000 to as high as $55,000. In Los Angeles, when aiming for the trendy fashion market, billboards on Melrose and Fairfax can range from $9,000 to $15,000. And the famous Hollywood Blvd. will have billboard costs from $7,000 to $13,000. For New York City, digital billboards in Times Square typically will have a smaller duration of about 2 weeks but range from $10,000 to $22,000, and billboards in the popular SoHo district of Manhattan can cost about $18,000 to $30,000 Freeway billboards cost more to rent than state highway billboards, because more traffic equals more impressions. A larger surface area logically means that a billboard is more likely to be seen and can be rented for more, but the relationship isn’t linear. It does not mean that a 77% larger billboard will exactly be 77% more expensive. And consider a double-stacked 10.6′ by 36′ billboard a couple miles away where each face rents for $400/month. The larger board is worth more than the smaller double-stacked boards. It should come as no surprise that the double-stacked 10.6′ by 36′ billboards get about 28% fewer impressions per period than the single 14′ by 48′ billboard. A small 8′ by 16′ poster will rent for even less. These posters in rural Indiana rent for approximately $500/month. A billboard with lighting can be expected to go for a 25% premium over a billboard without lighting because the billboard will be available to many more viewers at night. Lighting means more impressions. Casinos and all-night restaurants are especially interested in billboards that are lit all night. Cracker Barrel and some retail stores sometimes ask billboard companies to turn off the lights on a billboard prior to store closing times, so they don’t have customers pulling up to the establishment at closing time. A right-hand read, that is, a billboard on the right side of the road, will be more expensive than a billboard that is a left-hand read. 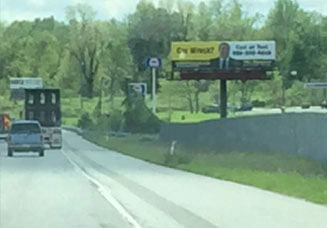 The reason is that a right-hand read billboard is closer to a car and easier to see than a billboard that must be read across several lanes of traffic. Take a look at this billboard in downtown Indianapolis. The right-hand read rents for $4,100/month. The left-hand read on this same billboard rents for $3,000/month. It’s a great, high-traffic location, but you look at the board across four lanes of traffic. 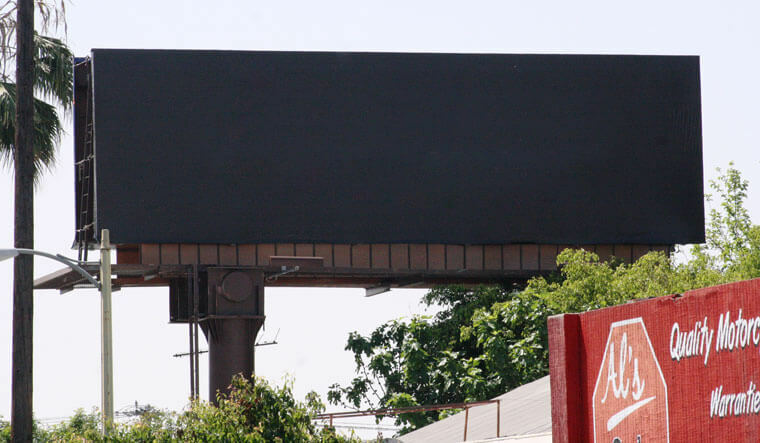 A setback billboard that is more than 600′ from the freeway will rent for much less than a billboard that is right against the freeway because it gets fewer impressions. Most billboards are within 45′ of the grade of the road which makes them easy to see. A billboard that is extremely tall – 80′ or 100′ feet above the road – will be cheaper because it will get fewer impressions. People won’t crane their necks just to see what’s on a sign. Trees can ruin visibility. This billboard has a public service ad that is probably free because the trees next to the road have blocked the view to the billboard. A billboard in an area with lots of other nearby billboards will sell at a steep discount. 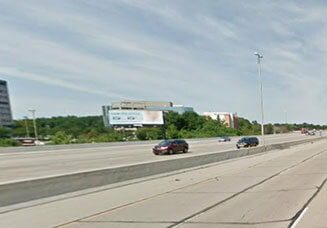 About 1,500 feet is the average setback between billboards in many cities. Some cities have no minimum setback or only a 500-foot setback between billboards. An area with lots of billboards very close together will have lower rates than an area with few billboards. Take this 10′ by 48′ billboard on a highway outside Indianapolis. The billboard has excellent, long reads in both directions. The billboard rents for only $300/month. There are numerous other billboards in the vicinity, many of which are vacant or running public service ads. The availability of plenty of competition has driven down the price. 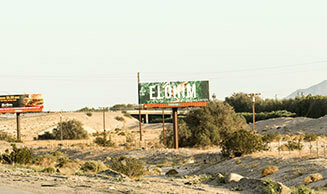 Look at these billboards packed together along a rural stretch of freeway in Nevada. They rent for $300/month. If there weren’t so many, you could expect rents for be $750-$1,500. Billboards don’t just cost money to rent; they also cost money to produce. The production of the billboard can range from $250-$750 depending on what type of material is being printed along with what size the billboard is. 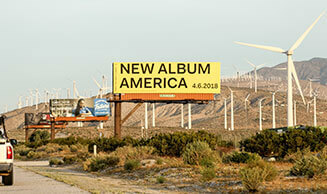 A 14’ by 48′ 7-oz vinyl billboard can cost around $400. Now that you know the variables that go into the pricing of a billboard, you can feel confident in setting your budget. You can also further discuss the details with DASH TWO by contacting us today. Thank you for explaining all this in so much detail. I’m a small business owner and I’ve been thinking about investing in billboard advertising. Obviously, I have a limited budget and I’m not looking at anything too expensive, so it’s nice to know that there are affordable options for smaller businesses. I can’t imagine paying tens of thousands of dollars a month for a billboard. 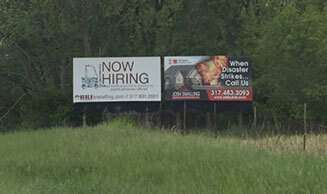 Choosing the right location for your billboard is key. It’s not only the matter of paying more. You also have to think about your target audience and timing, what other advertisements are in the vicinity of your billboard. You don’t want to risk becoming an Internet meme if the ad placement turns out to be unfortunate. It’s pretty cool how you can actually calculate impressions received by a billboard. I had no idea they can do that. But it makes sense. Those billboard prices can’t come out of thin air. Personally, I’m more familiar with Internet advertising. And I’ve never heard the term CPM used outside of that context. The more you know. Awesome article, thanks for sharing. Hi Jess, you said that right. The location of your billboard is the most important for effective advertising. The cost depends on the size and quality of the billboards. Backlite Media provide services that include billboards, lampposts and digital screen advertisements. Placing billboard in Dubai is considers as one of the best location for effective advertisements. I’m looking for specific cost for one billboard in my neighborhood. Tips? The easiest thing to do is look at the boards and see whose name is on it. Call them. They will give you pricing.